We receive a slew of books at the office every day, and I receive a slew of e-mails from publicists, asking us to consider their books. When the right book hits at the right time, I start to read. That's what happened with The Mindful Athlete: Secrets to Pure Performance by George Mumford (Parallax Press). Mumford is a former student-athlete who has become a mindfulness techniques instructor--for businesses, prisons and the NBA. He's worked with Phil Jackson for more than 20 years and is currently working with Jackson's New York Knicks. Of course, I exchanged a few e-mails with the publicist about the Knicks--who wouldn't?--but as I riffled through the book I saw these names: Lionel Messi, Shaquille O'Neal, Michael Jordan and... Anne Lamott and W.H. Auden. Then I saw a section on tai chi, which I have started practicing. I'll never be able to bring an opponent to the ground, but what Mumford says about the mind-body connection resonates with what I've learned. Mumford had been teaching mindfulness to prison inmates when Jon Kabat-Zinn recommended him to Phil Jackson, who was rebuilding a team--the Chicago Bulls--mired in a state of severe stress. Mumford brought to the Bulls a long practice of mindfulness, which came out of Buddhist meditation principles that he synthesized into "Five Spiritual Superpowers": mindfulness, concentration, insight, right effort and trust. (That practice has definitely come from Mumford's experience: college coupled with heroin, work as a financial analyst coupled with heroin, but finally, the "gift of desperation" leading to AA.) Over the years, he's taught many athletes how to be in "that very special place called the Zone." Cue a quote from Thich Nhat Hanh: "Life is available only in the present moment." With Memorial Day weekend at hand, beach reading season has officially begun. BuzzFeed asked: "What new book should you read this summer?" Bustle suggested "13 books to read by the fire on your next camping trip, because the season to be outdoors is finally here." Brightly discovered "6 vacation destinations for children's literature fans." And Microsoft founder Bill Gates shared his annual "summer reading list." "A boat trip showed Huxley a key creative influence. Mental Floss revealed "15 things you might not know about Brave New World." Quirk Books invited readers to "bibulate like a bibliophile: book pairings for your favorite wines." The "top 10 ways to be evil in children's books" were highlighted by the Guardian. You know you want one of these. The Bookdesk "is a combination of desk and bookcase," Bookshelf reported. When New Yorker writer Evan Osnos moved to China as a foreign correspondent in 2005, he set about trying to understand the country's metamorphosis into a free-market global superpower from the point of view of ordinary citizens. Age of Ambition is a revelatory and thoughtful look at the new China and its changing landscape. As it skips from the small town of Shropshire, England, to Tasmania and its wildflowers, Dave Goulson's debut treatise delights and informs on the varied lives and intricate behaviors of bumblebees. The Great and Holy War offers an alternate account of the Great War through the lens of its religious aspects--and how the war ultimately reshaped Europe's religious landscape. James R. Hansen believes Robert Trent Jones, Sr. was the greatest golf course architect of the 20th century. After reading this superb chronicle, it's hard to disagree. It's likely every golfer and reader of this fine book has played at least one of Trent's courses--he designed more than 400 worldwide. This brutally candid account may give readers hope that there's a hidden benefit to menopause: becoming courageously outspoken. Loh tries everything from yoga to a Greek yogurt diet to calm her careering hormones, but ultimately realizes that acceptance is the true path to enlightenment. Almost entirely outmoded because of the ease of GPS tracking and usually relegated to the maritime swap meet, the sextant was once a critical tool for sailors to pinpoint their location at sea. Sailor David Barrie brings us the history of the sextant, the men who used it and what it helped humankind accomplish. Iain McCalman has composed "a passionate history" of the Great Barrier Reef, opening with his own long-awaited voyage (part of a reenactment of Captain Cook's original trip). McCalman's writing is accessible to any reader interested in the intersection of science, nature and history. Osteopathic physician Gary Kaplan opens his exploration of chronic pain and depression by stating how assumptions of the most common or simplest diagnosis are futile. Even readers without chronic pain or depression will find Total Recovery fascinating. James Webb, a former Secretary of the Navy and decorated Marine, heard his call to enlist through his father's dedicated military service. Whether the reader agrees with Webb's perspectives on the Vietnam War, his narrative makes for a deeply sobering, poetic read. In 2011, biographer Phyllis Rose had a reading epiphany: most of us choose to read books prescribed by reviewers, awards panels, librarians and teachers. If we limit ourselves to the current and the canonical, she wondered, what are we missing? She decided to sample one shelf of fiction--LEQ to LES--in an Upper East Side library as a representation of the whole library. On April 18, 1983, a truck loaded with explosives crashed into the lobby of the United States embassy in Beirut, Lebanon. Among the 63 people killed in the bombing was Robert Ames, a CIA agent who had played a pivotal role in establishing a line of communication between the U.S. government and the Palestine Liberation Organization. David Sax takes readers on a journey deep into the heart of the specialty food industry and examines how different foods can go from little-known and hardly used to desirable fads that bring in millions of dollars. His conversational tone expertly informs and entertains as he breaks down why some foods become market staples and others are destined for the "specialty" aisle. Jack McNulty saw his share of danger in World War II, but he is no hero. He drinks too much and gambles away money he doesn't have. The Temporary Gentleman is the sixth in a series of novels in which Sebastian Barry fictionalizes the lives of his ancestors, with a perfect grasp of the wild and messy realities of actual lives. The darkest side of fairy tales comes true for one innocent woman in Claire Kendal's terrifying debut novel of obsession and violence. Clarissa has just come through a wrenching breakup, and finds herself fending off an increasingly violent madman with few resources at her disposal. Kendal's talent will win many fans. American Innovations, Rivka Galchen's first story collection, defies categorization, varying in tone from coolly surreal to nakedly emotional. Though occasionally perplexing, her stories are grounded in a keen grasp of detail and crisp, lively prose. A young New York City writer seeks the truth about a relative who reportedly killed her husband 50 years earlier. Readers will be swept away to Europe on the brink of the First World War and 1960s New York City, and Vivian is the kind of sassy heroine Williams's fans have come to love. Kjell Eriksson's Swedish police squad returns for a fifth time in Black Lies, Red Blood. While Beatrice Andersson and Sammy Nilsson head up the investigation of a murdered homeless man who'd just begun to turn his life around, Ann Lindell works on a missing person case--a 16-year-old girl who disappeared without a trace on her birthday. Ruth Reichl has been synonymous with "food writing" since 1972. In her first novel, a young woman works for an ill-fated food magazine, reminiscent of Reichl's days as editor-in-chief of the now-defunct Gourmet. The story soon goes beyond the autobiographical to encompass a richly detailed historic fiction of the U.S. home front during World War II. Kathryn Ma's incandescent debut novel, The Year She Left Us, is a stirring excavation of adolescent, familial and racial identity. For Ari, a Chinese orphan adopted in infancy by Charlie Kong--a Chinese-American woman in San Francisco--a frustrating lack of information about her birth family compounds her already festering teenaged angst. A dying woman has memories of two distinct alternate lives sprung from one seemingly small decision. As she lies in her nursing home, she recalls two lives: one in which she married her college boyfriend and had four children, and one in which she never married and raised three children with a woman named Bee instead. In a rich novel of family stories, Elise Juska chronicles the goings and comings of a large close-knit Philadelphia family--dinner by dinner, marriage by marriage, generation by generation. With a keen eye for detail and character, Juska shows us that, Tolstoy notwithstanding, a happy family can be happy in its own way and make for great storytelling. One afternoon, while Ellen is on her way to work, a young, blind woman boards the bus and Ellen instinctively intervenes to save the stranger from being mugged. Thus, two strangers become unexpected friends, changing both their own lives and the lives of others. 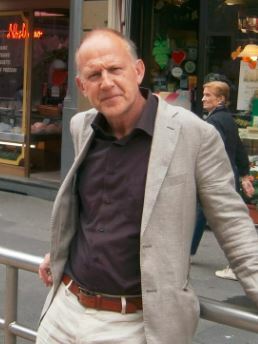 Tim Parks is a writer and translator. He has written 17 novels, including Europa, which was shortlisted for the Booker Prize, and, most recently, Painting Death. He is the author of several works of nonfiction, including Italian Neighbors and Italian Ways. Parks has also translated the works of Alberto Moravia, Giacomo Leopardi and Niccolò Machiavelli, among others, and is a frequent contributor to the New York Review of Books and the London Review of Books. He lives in Italy. Over the past three years, Parks has written blog posts on writing, reading, translation, etc., for the NYRB online, now collected in Where I'm Reading From: The Changing World of Books (New York Review Books, May 12, 2015). In your essays, you have challenged the glamorization of suffering and self-discovery in the traditional novel. So much fiction does come across as self-congratulation, however subtle the process may be. And a kind of shared complacency with the reader about our supposed sensitivity. One tries to resist it, aware that even that resistance could become a motive for self-congratulation. What do you think of the idea that the purpose of literature is to alleviate loneliness? Please, what a sad idea. It is. But deeply appealing to a lot of lonely people, it seems. When you are lonely, you can of course fill some empty space with the TV, a DVD, a book or some other surrogate. But this hardly solves the problem. In David Copperfield, Dickens has David take refuge in the company of books while locked in his room by the evil Mr. Murdstone. Nevertheless David still desperately needs real company, real people. In fact the very liveliness of the literary characters he meets in those books reminds him of that. And he is aware that the uses of literature go far beyond filling his hours of punishment. Essentially, the novels he reads allow his mind to move beyond the trap in which he finds himself. He is of course delighted when he gets out of Murdstone's clutches and finds real company. Though books never stop David from making the mistakes he always does make when dealing with others. Reading your essays, I began to see a similarity to critiques of forms of religion that also appeal to this desire for consolation and self-justification. Perhaps collectively we all have a vocation for denial. We reassure each other, thinking: if so many people believe this, why not take comfort in it? We go to churches, or read newspapers, or are members of clubs that confirm our opinions and reassure us as to the superiority of our culture, our sensibility, the talent we have, the community we belong to. A great deal of literature serves this function. All is well, then, until something comes along to undermine our protected world. An illness, a bereavement, a betrayal, a failure. Then we can go into an even more intense form of denial--he or she is not really dead, they are in heaven, my wife may have left me for today, but she is bound to come back, etc.--or we can look for some way to come to terms with things as they are. Giacomo Leopardi, a wonderful Italian poet of the early 19th century, makes this remark: "Works of 'literary' genius, have this intrinsic quality, that even when they capture exactly the nothingness of things, or vividly reveal and make us feel life's inevitable unhappiness, or express the most acute hopelessness... they are always a source of consolation and renewed enthusiasm." This seems to me an interesting paradox. Sometimes it is precisely when we turn away from the protection of denial and face trouble without demands and expectations, that we find unexpected resources. I guess if we're talking about my book Teach Us to Sit Still, the story I tell there turns on the moment when I was forced to realize that there was no help or good news to be had from the folks I'd previously thought would get me through my condition, the doctors in particular. And again when I realized that my obsession with words and books and the hope that they might constitute a sort of alternative world in which I was powerful, was actually part of the problem, not the solution. Books were doing me at least as much harm as good. In general, when we see art, books, stories, whatever, being presented to us as a kind of panacea and somehow necessary for the survival of civilization, etc., we should always wonder whether in fact they are not part of the problem. Which writers have offered you a more clear-eyed perspective on the world? Perhaps more interesting is the way different thinkers or artists speak to us in different moments depending on where we're up to, what we're going through, where we came from. So I went through a phase, for example, when I was in love with Emil Cioran's writings, or Thomas Bernhard's. They offer such a withering vision of Western pieties. But these are not what I'm after now. And then, it's not so much the aphorism or aperçu that interests me these days, but the whole way the world is presented with its seductions and conflicts. I want it to be fresh and convincing, not simply to "do literature." I've been enjoying the work of Swiss writer Peter Stamm a lot. I frequently go back to old favourites like D.H. Lawrence, Beckett. Their very restlessness is encouraging. You've discussed how the global literary marketplace encourages universal themes and easily translated prose, and the ideal of an artist who speaks to everyone. Despite this, you have developed diverse audiences in various countries. How do you think about them when you write? The nature of modern communications is such as to make us aware of being part of a global community as well as a local community. We are daily informed of events and attitudes all over the world. Where I live, 70% of the books on the shelves are translated. So readers and writers do not think of writing as specific to a national community. Obviously this shifts the way people write a little. They know a book could be read worldwide, not just by their fellow nationals. It also shifts the way publishers select and promote books. As for myself, I've been in the curious situation of having my writing split in different worlds, both geographically and in terms of different reading communities and academic communities. Essayist for some, novelist for others, translator for others again. Probably if one piece of work achieved major celebrity that fragmenting would be overcome. But I actually rather like the situation. In her debut novel, The Anchoress, Australian writer Robyn Cadwallader tells the story of 17-year-old Sarah in 13th-century Midlands, England. Devastated by her sister's death in childbirth, Sarah chooses to devote her life to God and holiness, deciding to become an anchoress. It's a powerful, quiet story of her self-imposed confinement in a small stone cell next to a church. After she enters her room, the door is hammered shut: "I'd thrown away everything in this world and leaped into the air, lighter than I'd ever been, flying to God." She has a pallet with straw, thin blankets, a commode, fireplace, altar, crucifix, a few prayer books, some clothes and two small shuttered windows--one to talk with Louise, who brings her food and water, the other a squint through which she can see the church's altar. Beneath her feet is buried the body of the previous anchoress, who died in the cell. For Sarah, it's a "place of life in death." Feeling guilty that she isn't being holy enough, she resorts to self-flagellation: "Slashes of red. The warm trickle of blood." Discover: The still, quiet and intensity of a young woman's contemplative life as an anchoress in a small stone cell. Is there anything left to say about suburban family dissolution and the edgy temptations of adultery that Updike, Cheever, Moody, Homes, Perrotta, etc., etc., haven't already said? As it turns out, there is. In Housebreaking, Dan Pope's second novel, the uneasy cohesion of two suburban Hartford families comes unglued across generations. When Cadillac dealer Benjamin Mandelbaum gets booted from the home of his wife and children, he takes his dog and moves in with his widowed father, Leonard, the glad-handing, generous founder of their Wintonbury dealership, who is being wooed by a dead acquaintance's smart-mouthed widow, Terri. Benjamin is "hollow and alone"--until he chances to meet Audrey Martin, a former high school classmate newly moved to Wintonbury, walking her dog. If the Mandelbaums have their troubles, the Martin-Murrays have even more. Audrey's husband, Andrew Murray, is a high-powered lawyer with no qualms about stepping on associates--until one junior lawyer plans a career-ending, sexual harassment plot against Andrew. Over the course of one summer and fall, the secretive intertwined troubles of the Martin-Murrays and the Mandelbaums come unraveled over the always-fraught Thanksgiving holiday. Pope (In the Cherry Tree) presents these broken suburban families with a narrative that moves the story along with straightforward plotting and rich characterization. If Leonard and Terri are the generational outliers in the primary drama, they are also the most colorful characters. They bring a fresh piquant taste to a plot that has been worked many times in many ways--and likely will be worked again. Suburban families are too rich a vein of modern life to avoid heavy fiction mining. The fresh rewards come with the strength of the storytelling--like that in Pope's Housebreaking. --Bruce Jacobs, founding partner, Watermark Books & Cafe, Wichita, Kan. Discover: Steady prose and rich characters bring new life to the familiar story of a suburban family unraveling. Jessica Knoll, a former Cosmopolitan magazine editor, makes an adroit debut in book publishing with her novel, Luckiest Girl Alive. Ani FaNelli is an editor at a women's magazine in New York City, and engaged to the JFK, Jr.-esque Luke Harrison. Before Ani ties the knot, she agrees to be interviewed for a documentary about the devastating events that occurred while she was a student at an august prep school in Pennsylvania. The tragedy rudely thrust her into the public eye 14 years earlier, and Ani finally wants to set the record straight. In doing so, she could also unravel her seemingly perfect world. Ani may come across as snarky and shallow at first, going to great lengths to curate an enviable life, complete with a glamorous job, aristocratic fiancé and four-carat engagement ring. But as her secrets are revealed, so is her vulnerable side. What happened to her as a teen--and is happening now too often to young people in real life--would destroy the average person, but it fueled Ani to strive for the brass ring. To her, success is the best revenge, and readers will want her to achieve it. Discover: A successful magazine editor confronts her dark past, which could change the present. Irish literature has a great tradition of novelists who love farce--Flann O'Brien, J.P. Donleavy, Roddy Doyle, Roger Boylen. Add to them first-time novelist Jeremy Massey. His smart and sassy The Last Four Days of Paddy Buckley is an outstanding contribution to this distinguished Irish tradition. Paddy, a decent, 42-year-old undertaker in Dublin, claims Mickey Mouse as his patron saint. Mickey, he says, could always get "out of the soup with [his] spirit intact." This is what Paddy needs because just four days ago he faced a "set of circumstances so outlandish, so surreal, and so dangerous" they could only result in his death (so he says). One October morning Paddy visits Lucy, a beautiful widow, to arrange her husband's funeral, and ends up in bed with her, where she dies of an apparent prescription drug overdose. Now he has to cover it up, plus deal with "my DNA lining Lucy's birth canal." It's just the beginning of this madcap comedy of errors. When Brigid, Lucy's lovely daughter, arrives, Paddy has to tell her of her mother's death. As he comforts her, he realizes that she's someone he's really attracted to. Driving away at 3 a.m., thinking about Brigid, he accidentally runs over a man. He recognizes him; it's Donal Cullen. His brother Vincent is "Dublin's number one thug." Can it get worse? Discover: A hilarious romp through Dublin as an undertaker's ordinary life is suddenly turned into a bizarre comedy of errors. A Texan vegetarian cookbook may seem oxymoronic, but Laura Samuel Meyn and Anthony Head prove that the bold, audacious flavors associated with this state's cuisine are a perfect complement to a healthy, compassionate, plant-based diet. The authors met in 1997, the only vegetarians on staff at Bon Appétit. "Laura was 16 when--looking at her mother over a half-eaten chicken pot pie--she came out as a vegetarian. The signs were all there--the early love of... Charlotte's Web; the uncommonly strong bond with the family dog." Head saw the merit of a plant-based diet while researching the link between red meat and cancer for Bon Appétit; he cut out poultry when his father was diagnosed with prostate cancer; and "when he became a dog owner, well, he gave up eating anything that could choose to save its own life." Their recipes focus on seasonal produce abundant in Texas--pecans, peaches, tomatoes, berries, kale, corn--and in addition to vegetarian recipes, gluten-free and vegan options or adaptations abound. Be sure to read Head's section on alcohol before jumping to the recipes. He shares the classic food-and-wine logic of "what grows together goes together" and recommends Texas wine and beer pairings with many of the dishes. Discover: Vegetarian meals that are delicious, celebratory and unexpectedly Texan. Readers who are only vaguely familiar with Golden Age detective fiction, written mostly during the 1920s and 1930s in Britain, often fall prey to a set of false assumptions. These novels are often stereotyped as "cozy," dismissed as lacking in psychological depth or shocking twists. In The Golden Age of Murder, his fascinating study of London's Detection Club of mystery novelists (founded in 1930), Martin Edwards dismantles these theories in a manner worthy of the finest fictional detective. Edwards, himself a mystery novelist and the Club's current archivist, opens with an account of the Club's initiation ritual, which includes ceremonial robes, lethal weapons carried as accessories and a human skull known as Eric. Focusing on the Club's three prime movers--Anthony Berkeley, Agatha Christie and Dorothy L. Sayers--Edwards chronicles its history and showcases the many ways in which its members past and present have pushed the boundaries of detective fiction. True crime, forensics, political passions and complex personal entanglements all had a shaping influence on members' lives and their books. Edwards addresses all these and more, setting his brief biographies within the context of the turbulent times in which these writers lived. Discover: A fascinating, witty account of the Detection Club of mystery novelists in London and its members' powerful influence on detective fiction. In 1889, an oil refinery clerk who loved the works of Shakespeare went into a Manhattan auction house and purchased a Fourth Folio of the bard's plays, printed in 1685, for $107.50. Thus begins Andrea Mays's captivating The Millionaire and the Bard, a chronicle of the buyer, Henry Folger, and his lifelong pursuit of First Folios--a First being the "most valuable English-language book in the world." To begin, Mays unfolds in fascinating detail the story of how the book miraculously came about. While Shakespeare lived, copies of his plays were "ephemeral amusements not serious literature." Seven years after he died in 1616, two actors decided to collect their friend's plays and publish them on durable rag paper folded only once. The actors sold the First for £1; buyers had to bind it themselves. Discover: The intriguing story of a book, the man who wrote it, the eccentric millionaire who coveted it and the library he built to house it. In the first essay of Kate Brown's Dispatches from Dystopia: Histories of Places Not Yet Forgotten, she writes about standing on a low hill in the Ural Mountains, where she puts one foot in Asia and one foot in Europe. Likewise, Brown's book masterfully straddles the line between personal travelogue and academic research. Her essays jump from a war-torn region of Central Asia to a forgotten hotel basement in Seattle, and Brown (Plutopia) argues that history is much better served by historians who put themselves in the places they research and the essays they write. "Why, in disciplines that aspire to verifiable truth, do scholars sustain the fiction, when researching and writing, that they are not there?" she asks in her introductory essay. By situating herself in the physical place she studies, and within the writing that is born from the experience, Brown reports details other academics would pass over. In "History (Im)possible in the Chernobyl Zone," she arrives in Ukraine to find that her source has been an online persona with no actual expertise. Brown then wanders the streets alone, attempting to uncover historical facts ignored by people traveling to Chernobyl for its post-apocalyptic imagery. From a cliff above Billings, Mont., in "Gridded Lives," she accounts for the similar physical and political utilitarianism between an oil-boom town's street grid and the factory zones of the former Soviet Union. Discover: Detailed, first-person reporting on the lingering impacts of war and movements that continue subtly to affect Western society. Deborah Lutz's (Pleasure Bound) fresh and novel The Brontë Cabinet examines in detail nine objects owned and used by the Brontës--Emily, Charlotte and Anne--in order to reveal the "secret existence" the possessions held for them and how they influenced the sisters' writings. Lutz places each object "in its cultural setting and in the moments of the everyday lives of the Brontës." The intriguingly titled chapter "The Alchemy of Desks" is about the sisters' portable writing desks, covered with ink stains. Emily called hers a desk box; inside it were pieces of chalk, fragments of lace, an empty cardboard box marked with her initials, EJB. Each leftover, "no matter how enigmatic and insignificant, seems to shine out with meaning." In "Tiny Books," Lutz discusses the books the sisters created as teenagers by folding pieces of paper and sewing them together to form "a rudimentary booklet of 16 pages, about the size of a matchbook," that they filled with words written in the tiniest of scripts. In addition to numerous household duties, the sisters spent hours dealing with the "swatches and cloth fragments they stitched, turned and hemmed." Lutz sees their products as "physical monuments to the business of their days," during which they could mentally compose their poems and novels. Discover: The world of the Brontë sisters as illuminated by some of their personal possessions. Fed up with her safe and on-track life, in which she felt she was in a deep and narrow rut, Hannah Papp turned her back on a good job and boyfriend in the United States and set out on an adventure that changed her life. She moved to Budapest and spent two years there, but this turned out to be just the first stop on a quest that led her to backpack, often alone, through Italy, Spain, Greece, France, Switzerland and Austria, and travel on a small boat across the Mediterranean. Discover: Tips and techniques on how to set out on a soul-awakening adventure. In his beautifully rendered, wordless debut, Yuan Pan chronicles the deepening bond between father and son and the pain of its loss. The artist uses panoramic and close-up views in sepia tones to convey the passage of time. A landscape view of clustered rooftops places readers in China. A quartet of scenes shows father and son preparing a simple meal, chopping and stirring, then sitting together at a wooden table, eating with chopsticks. The father sees his son to the bus stop, then waves goodbye, as the young man watches through the bus's rear window. Pan brilliantly telegraphs the passage of time by repeating the father's wave in all seasons, in a suite of four views that stretch across the center of a double-page spread. His art calls to mind Shaun Tan's work in The Arrival as the son, now a man, travels overseas by plane to an alien land of staircases with mysterious endpoints and serpentine highways. A quartet of images of a single tree through the four seasons creates a visual resonance with the father's farewell wave in the previous four-part suite. And then, a late-night phone call summons the son home, over the clustered rooftops, to his bedridden father. Discover: An artist makes his children's book debut with a wordless tale about losing a parent that delivers an emotional wallop. Alicia Potter's (Mrs. Harkness and the Panda) words and Birgitta Sif's (Oliver) illustrations work in tandem to provide warmth, humor and charm in this tale of pets and their people. When Miss Hazeltine opens her Home for Shy and Fearful Cats, she is surprised by how many people drop off their pets. Some are afraid of mice and birds; some won't purr. She offers classes on many topics, including Bird Basics, Climbing Up and Climbing Down, Scary Noises and (the hardest) How Not to Fear the Broom. One cat, Crumb, is more frightened than the others and hides all day long. When Miss Hazeltine heads out to fetch a bucketful of milk, she trips and sprains her ankle and is unable to return to her charges. They all muster their courage and head out into the night to rescue her. Bringing along the feared broom from their training, the cats find Miss Hazeltine and help her back home, confirming that they have become cats who are "Shy and Pretty Brave If You Ask Us." Discover: An engaging picture book that reminds us we can all find courage when we need it. In his first book for young people, Sean Ferrell (The Man in the Empty Suit) teams up with debut children's book artist Charles Santoso for a deliciously creepy tale of a child and his toy koala. When young Adam opens a striped gift box, he takes an immediate dislike to Koala, whose "terrible eyes" follow him wherever he goes. Santoso depicts the plush toy with its back to readers on the left, as Adam peers at Koala from behind the gift box's top on the right. A full-spread close-up of the toy exposes Koala's left eye askew. In a series of comical vignettes, Adam "tries to explain" to his parents (through his animated antics) his dislike for his gift. Santoso shows the stuffed toy in lifelike poses, peering at Adam with his off-kilter eyes during the boy's bedtime routine. Adam tries to ditch the disturbing marsupial, but when he wakes, "Koala is always there. In his bed. On his pillow." Santoso's subdued palette of rose-pink, beige and ocean blue against cream-colored backgrounds keeps the focus on Adam's fear-stricken face and Koala's menacing eyes. "Hills" and "rocks" correlate to the stairs and couch. Finally, when Koala protects Adam against finger-like shadows in the moonlight, he earns the boy's affection--only to alienate Adam's parents ("I don't like Koala," mother and father confide to each other). Discover: A clever picture book that walks the line between humor and horror for a child afraid of his creepy toy koala.